Ollie Octopus has a watch for each arm but he can't tell the time! Can you help him tell the right time by drawing the hands on each clock to show the time it says underneath? It would really help Ollie to know what time it was, then he wouldn't be late for school! 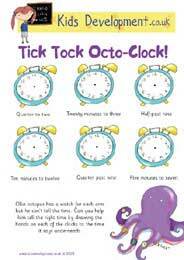 Why not Download the Tick Tock Octo Clock Puzzle right now and see if you can help. This puzzle is aimed at 5 to 7 year olds, it's a fun way to teach children how to tell the time, as well helping to build their problem solving skills. I love this website. It gives me more ideas and concepts about the child developmental stages and good things to do with little kids. Thank you.